Spree Commerce and Magento: Which Platform is Most Advanced? Comparing Features of Spree and Magento: Which Platform is the Most Advanced? Spree Commerce and Magento are two of the most commonly used ecommerce platforms, and relentlessly compete for our favor. Which platform is best for your project? We’ve already compared these two platforms to help you find an answer, but in our previous article we reviewed only four aspects of these platforms: development and support, pricing, number of extensions, and development complexity. What we didn’t touch on is what features they offer. Since you need a broad understanding of both platforms to make the right choice, today we’ll compare their functionality. These aren’t all the feature stacks that are available in the platform we review. All other features will be listed in the comparison table. But before we continue, let's get the obvious stuff out of the way. First and foremost, it would be unfair to compare a more advanced, paid product – Magento Enterprise Edition – with the open source Spree Commerce platform. That’s why we chose the Community Edition for our features comparison. 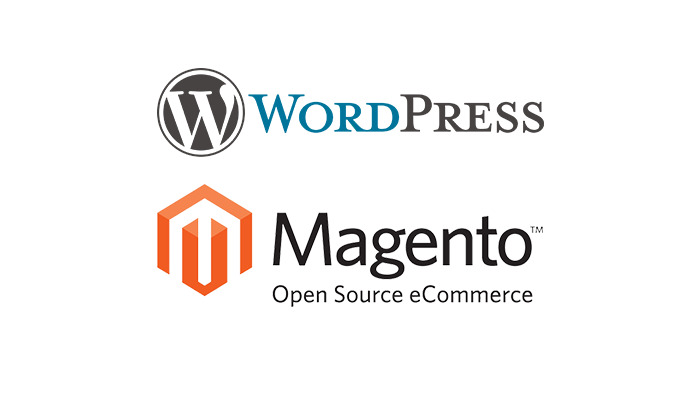 Magento CE is an open source platform and a true competitor to Spree. Second, the Magento Community Edition core library is much, much larger than Spree’s library. In fact, it would be strange if Magento didn’t have more features and more advanced features than Spree due to its larger codebase. One major difference between these two platforms is that Spree’s developers extracted many functionalities from the core and provide them as separate libraries. You may install those libraries as you need. What’s more, Spree Commerce is just a Ruby on Rails engine (a small application). 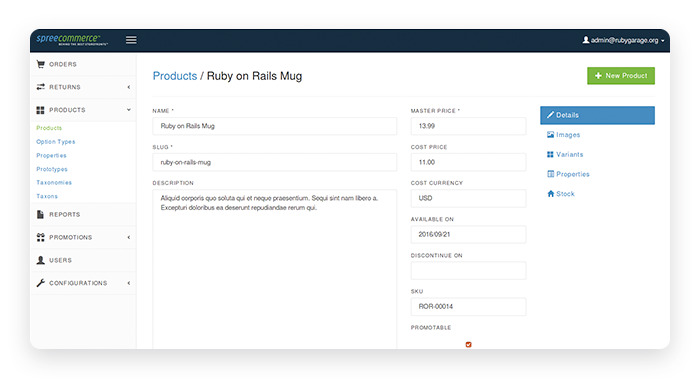 This means that this Rails-based platform can be paired with any Ruby library or Rails engine to get more features. The bottom line is that both ecommerce platforms can and should be extended with extra features depending on your business needs. Handling products and product listings is an essential functionality for any ecommerce platform, so let’s start by considering how each ecommerce engine manages products. Even small ecommerce stores manage a decent amount of merchandise, and want to do so as efficiently as possible. Spree and Magento functionality is pretty similar with regard to how they let you add and edit products and product details. You can categorize and customize products however you like with both ecommerce platforms. Let’s look in more detail at their features for managing products. Spree provides a series of six tabs where you can view, add, remove, and edit products and product groups. In these tabs, you can specify such product details as price, quantity, availability (period of time when an item is available), shipping, and tax categories, as well as product options and product categories (they’re called taxons in the admin panel). Copying a product and creating multiple product variants is also possible – and very simple. What’s more, with Spree you’re able to create product prototypes. Creating prototypes greatly simplifies the creation of new items of the same type. For instance, if you create a toaster prototype, you can save time when adding new toasters to your store’s inventory. When you add a new product to your store, you’re able to fill in certain details right away simply by assigning the product to its prototype. Still, you can add unique features for separate products if necessary. What about Magento’s capabilities for managing products? Magento’s basic features are identical to those that Spree offers in its standard library. But Magento bests Spree in some regards. For example, you can upload not only images of a product, but also videos. Magento also allows for many more new product attributes. It should be noted, however, that the true business value of these additional attributes is questionable. 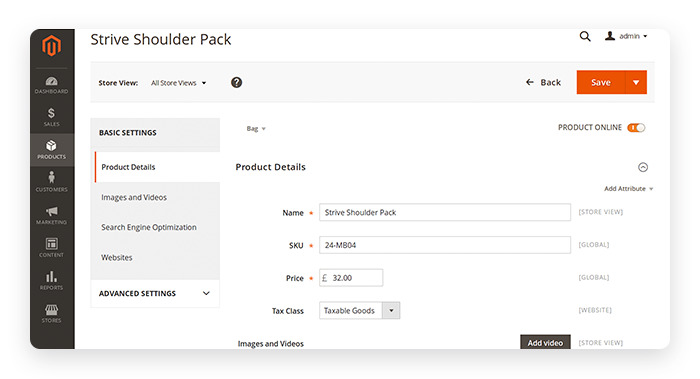 When you add new items in Magento, you can set many parameters, such as advanced pricing (a special price for certain dates) and advanced inventory (how many items can be added to one cart). That’s not possible with the standard Spree package. But the features we’ve mentioned so far aren’t all the features you need with either Spree or Magento. Here’s the thing: You want to sell as much merchandise as possible, and there are many techniques to increase sales. Online stores can show related products during checkout. Stores can also upsell and cross-sell. These merchandising functionalities also must be present in a complete ecommerce platform – and Magento and Spree do have this kind of functionality built in. As we’ve mentioned before, Magento lets you set advanced settings in the Magento admin panel for new items. In the Magento admin panel, you can also change options for upselling and cross-selling. For Spree Commerce, the Spree Related Products extension helps you configure relations among various items. In other words, Spree Related Products allows you to add product accessories, cross-sells and upsells; assign compatible and replacement products; and offer warranty and support products on product pages. Whether or not you’re going to provide content on your ecommerce store, you should not ignore the fact that content management might be vital for your store’s success. At the very least, you’ll want the ability to add and edit static pages such as About, Terms and Conditions, 404 pages, and so on. But it’s equally important to fill your website with product reviews and articles to help customers find the best products for them. Plus, with a lot of content, an ecommerce website will get a higher ranking in search results, which will result in more people visiting the website and more opportunities to sell. Additionally, your online store must allow you to manage media files – images, videos, and audio. So how do Magento and Spree handle all of this content? Magento Community Edition comes with static page management. In the page management tab you can view static pages, add as many new pages as you need, and edit them in a WYSIWYG text editor. Magento also allows you to manage metadata and titles for each static page and even set up layout properties, as well as enable and disable the page for various store views. That’s quite a range of options. Spree Commerce doesn’t trail far behind, although it has no built-in tool for managing static pages. To set up and edit static pages with Spree, you must use the Static Pages extension. 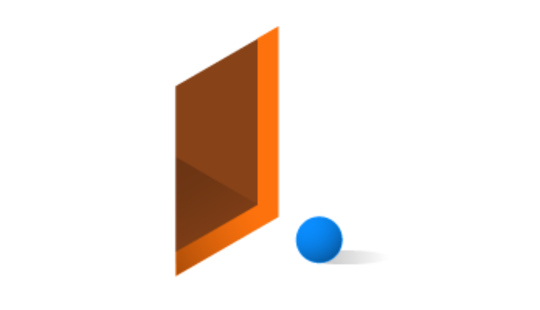 This small library provides very much the same functionality as Magento’s core platform. The basic Spree platform is also bereft of an advanced text editor, so you’ll need to install another extension for this functionality – an editor. This extension lets you pick between one of two editors, namely CKEditor or TinyMCE. We intentionally didn’t mention anything about platforms’ capabilities for blogging and managing media files since both ecommerce platforms lack a built-in blog engine and a tool to edit images and manage videos. To enhance your online store with a blog, you’ll need extensions. 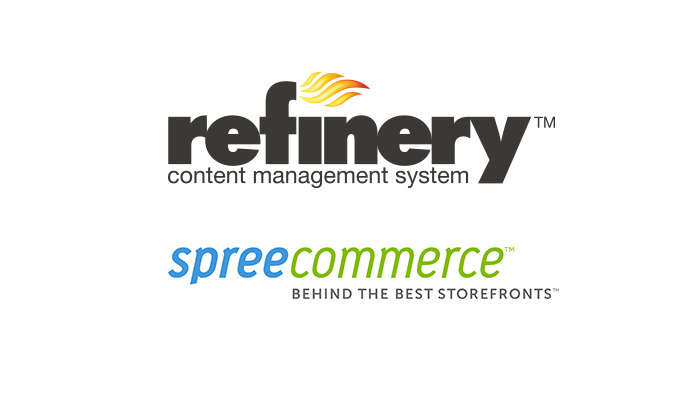 Spree Commerce can benefit from Refinery CMS, which is a top Ruby on Rails engine that allows you to add, remove, publish, and edit articles and content for those articles. As for Magento, there are several blog extensions available. Some are free, while some cost as much as $349. You can even opt for WordPress. In the end, both platforms are fairly equal with regard to the functionalities they offer for content management. Spree simply requires two more extensions than Magento, but they’re very easy to install. An online store must be easily searched and crawled by search bots. If each website page is optimized for search engines, then product pages will rank higher in search results. Good search engine optimization (SEO) is a must for any website, and especially for an online store. So what SEO features does an ecommerce platform need to provide? An SEO specialist would immediately point out that each product must have its own meta description, meta title, and meta keywords. Search engines analyze metadata to understand the relevance of a product for a user. Another valuable optimization is breadcrumbs. These are simple links for easy navigation from product categories to sub-categories and individual items. Search engines will like your store even more if it has a sitemap – a webpage that contains references (links) to all store pages. Other helpful optimizations include image descriptions and support for analytics tools like Google Analytics. All of these SEO optimizations are possible with each ecommerce platform. Each items you'll sell on your Magento or Spree-powered website includes fields for metadata and image descriptions. Pay attention to the fact that Magento has a sitemap built-in, while Spree requires an extension called Spree Sitemap. Both ecommerce solutions have support for Google Analytics at their core, and, overall, both are well qualified to help you achieve good SEO results. Sales, inventory, and tax rates – the online store administrator must keep a firm eye on all these things. A ready ecommerce platform must include all functionalities necessary to track all the moving parts in the online store. Spree Commerce lets administrators handle all financial matters. 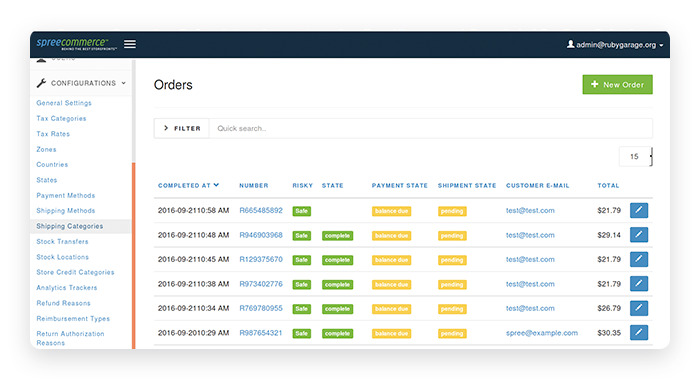 Administrators can view order details and change order status – created, shipped, paid, returned, approved, etc. Administrators can also manage order fulfillment and change price adjustments (taxes) for each order, as well as manage tax rates for different product categories. To change tax rates, the administrator must define various tax zones by countries and states. Spree handles all these financial matters with ease, and also reveals sales statistics. This platform also allows administrators to create new users and edit a user’s shipping address, contact information, and any other details they may provide. Magento Community Edition has even more functionality for administrators than Spree does. For example, in Magento you can export sales statistics or orders in a CSV or Excel file. Also present in Magento and lacking in Spree is batch processing – the ability to cancel or update multiple orders or invoices at once. Reporting in Magento is much more advanced that in Spree. Magento reports are divided into several groups: marketing, sales, products, reviews, and customers. Each group gives access to a number of tabs containing various data you might be interested in. 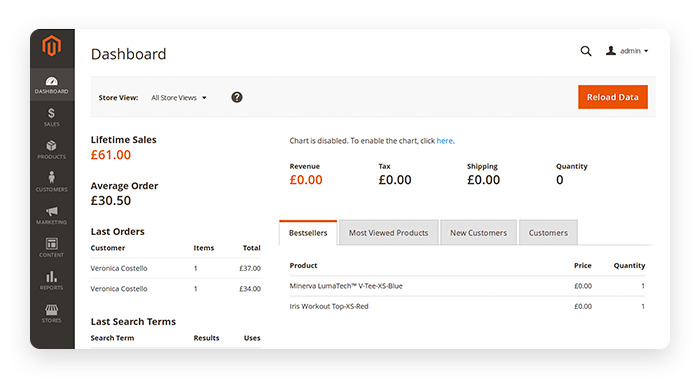 For example, product reports show you which products are your bestsellers, which products get most views, or which products are running out of stock. You get a similar level of detail in the refunds reports: you can view all refunds and related products along with specified reasons for the refund. The Spree Commerce platform, on the other hand, only lets you define reimbursement types and refund reasons. Magento definitely includes plenty of tools for administrators. But Spree’s admin panel is easier to tweak. In other words, with Spree it’s easy to add only the features that administrators will actually require and use. So who’s winning the ‘Audience Award’ for the most features? It’s a tough call. We’d say that both Magento Community Edition and Spree Commerce are feature-rich ecommerce platforms. If you wish to have more advanced features right away, then Magento is a good call. But then you’ll have to accept the fact that Magento core is very complex. Plus, it’s challenging to extend and support a Magento store without breaking it, and not all Magento core settings are really necessary. The Rails-based ecommerce engine lacks certain features. It won’t allow you to set table view for products, for example. But do you really need that flexibility? It’s up to you to decide whether or not there is real business value in this type of functionality. What you get with the Rails-based ecommerce engine is enough features to get started and complete freedom during development. You can even go as far as making your own version of Spree that supports only the features that your ecommerce website genuinely needs. That’s what Bonobos did: they forked Spree Commerce 2.4 and made their own project called Solidus based on that version. By now, you should have enough information to choose the platform that you think is best for your own online store.